Colonial artist ST Gill portrayed 19th-century Australia’s bush, towns, goldfields and cities alike in vivid detail. Now, more than 200 of his artworks are on display at the National Library of Australia in Australian Sketchbook: Colonial Life and the Art of ST Gill. Curator Sasha Grishin traces the life and times of this unsung artist, and explains why his work remains so powerful. Who was Samuel Thomas Gill and why is he so important that the National Library of Australia is devoting a major three-month exhibition to him? Gill was born in 1818 in Perriton, a small village in Somerset, England, where his father was the Baptist minister. He grew up in Devon and Cornwall, where his parents ran separate schools for young gentlemen and young ladies. Gill initially studied in the home school before attending William Seabrook’s Academy. He worked in an art framing and lithographic print shop in Devonport and then painted backgrounds for a London-based silhouette studio. Following the death of two of his siblings in a smallpox outbreak, Gill and his family migrated to the newly established colony of South Australia. They arrived just before Christmas in 1839. The 21-year-old Gill immediately launched himself as an artist with advertisements in the press offering his services. It was probably during his first couple of years in Australia that Gill painted a series of watercolours of the Labours of the Months and the Four Seasons in the National Library collection, where he translated an English pictorial tradition into terms of the South Australian agrarian calendar and placed it within a localised South Australian setting. November, for example, was the month for shearing, where Gill painted possibly the earliest shearing scene in Australian art. In 1846, Gill embarked on a journey of exploration led by the grazier John Horrocks, which ended tragically when the explorer was shot by his camel. Horrocks, in keeping with the European explorer/naturalist tradition, shot at everything that was unusual and collectable. On seeing an attractive bird, he decided to shoot it, but when loading his shotgun, he unwittingly rested against Harry the camel. The camel jerked and the shot was released into Horrocks’ face and hand. As the explorer lay dying, Gill nursed him over a number of days, but to no avail, and when he died the hapless camel was put to death on the explorer’s orders. Gill produced 33 watercolours on this journey, which were exhibited to considerable acclaim in Adelaide. Country NW of tableland 1846, by artist ST Gill. Courtesy National Library of Australia collection. The economy of South Australia dipped badly once gold had been discovered in neighbouring Victoria and the colony was severely depopulated. Gill joined the rush and left the colony for the Victorian goldfields. There is no evidence that he set out in search of gold, but by mid 1852 he had commenced sketching on the goldfields of Mount Alexander, Bendigo and Ballarat. 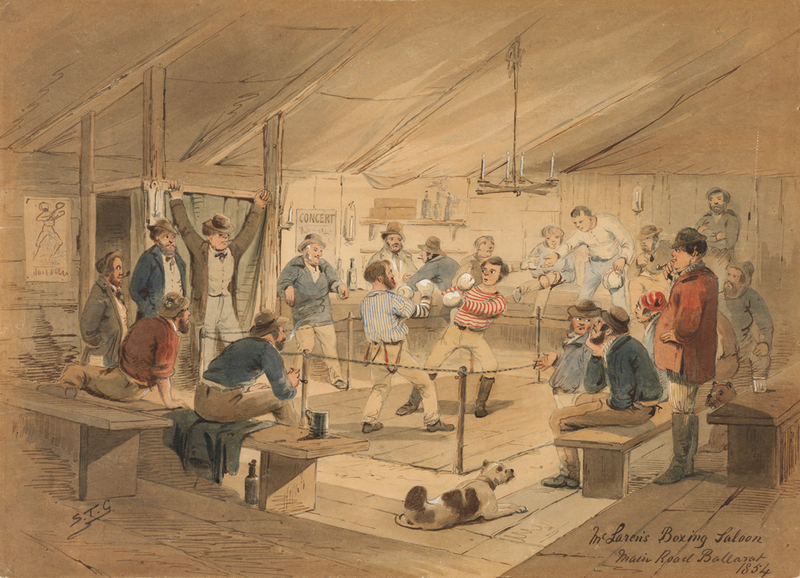 Between August and October 1852 his 48 lithographs, Sketches of the Victoria Diggings and Diggers As They Are by STG, were issued in two sets. Almost overnight Gill became the highest profile artist of his day. Unlike many of his fellow artists, Gill set out to give the gold rushes a human face. He translated the whole enterprise into a number of human situations, which rang true to the experience of those who were on the goldfields in the early 1850s. Gill’s little lithographs recorded the unfolding environmental catastrophe on the goldfields, where the trees had largely been felled, streams clogged and the human anthill had eroded the surface of the ground. Gill grew increasingly critical of some attitudes of the mother country, especially towards the Indigenous peoples of Australia and its flora and fauna, and he frequently started to champion a new breed of people — the Australian digger — who was tough, resourceful and resilient. He also to some extent became the conscience of Australian colonial art and on many occasions he depicted the ‘dark side’ of life on the goldfields. While politicians and some of those in the media whipped up hysteria about people from Asia, called coolies or celestials, who were said to be invading Australia to steal jobs and gold, Gill showed hardworking Chinese living in harmony with the other miners. He created the first image of a Chinese takeaway restaurant in Australia, where food was advertised as being always ready and with customers taking it away in canisters. John Alloo’s Chinese Restaurant Main Road, Ballarat, 1855, by artist ST Gill. Courtesy National Library of Australia collection. Although the presence of women on the goldfields was widely noted in written accounts, as well as in some journals kept by the women themselves, they are almost invisible in the art of the goldfields. Gill was the exception. Gill’s women of the goldfields were not shy, dainty things, but women of character. After four years in Victoria, Gill had developed a high profile. Likened to the famous British satirical artists Phis and Cruikshank in the press, Gill was quickly becoming a household name. However, reputation was not to be equated with financial success and in January 1856 we have a newspaper advertisement for an auction of a ‘splendid collection of watercolour drawings’ by Gill. He left his wife Victoria abruptly for another woman, Elizabeth, with whom he eloped and fled to Sydney, where he arrived in May 1856. In Sydney, Gill failed to replicate his success in Melbourne and although he was in demand in some quarters, he struggled to make a living. Here, his political ideas increasingly crystallised as he produced images of Aboriginal peoples shown dispossessed and locked out of their own country. Gill was back in Melbourne by early 1864 and was to stay here for the remaining 16 years of his life. During this period in his art practice he was diverse, prolific and worked at the height of his powers to produce some of his most incisive and profound works. Increasingly his work of the 1860s celebrated an Australian reality, an Australian way of life and the Australian character. Elements of the Australian character, which may have formed in rural Australia by the 1840s, were brought together on the goldfields in the following decade and were given their earliest pictorial articulation in the art of Gill. His bushman is the one who appears throughout the pages of The Australian Sketchbook, huddling by the campfire with his dog, protecting the herd, branding the cattle, seeing the Aboriginal people as equals with whom he labours, searching for a lost child in the bush and finding peace in a bush funeral. Gill’s cast of male and female characters, which included the stockman, the ‘bushie’, the city dweller, the ‘pure merinos’ and the street urchin, struggle with the elements, the droughts and floods. They discover a unique beauty in the Australian landscape and enjoy a sense of oneness with their country. McLaren’s boxing saloon, Main Road, Ballarat, 1854 by artist ST Gill. Courtesy National Library of Australia. In the 1860s Gill also produced some of his most insightful images, which critiqued the society that surrounded him. A number of these were realised as lithographs and published in Melbourne in 1866. When Gill left Victoria, it was during the glow of Marvellous Melbourne; when he returned eight years later, not only the city had changed, but so too had its art collecting society. Gill’s wonderful and gritty conscience-pricking watercolours and prints were no longer in vogue. Melbourne’s art establishment was perhaps less interested in being reminded of where its money had come from. Glowing romantic landscape oil paintings by von Guerard, Chevalier and later Buvelot and their numerous pupils and followers became the hot collectables with Melbourne’s emerging self-conscious art audience. Gill was never going to change his spots, but his art did become increasingly marginalised. In a late self-portrait, titled On Sale, Original Sketches & Drawings by S.T.G., the artist shows himself seated against a brick wall next to an inverted umbrella full of his drawings, which he offers for sale. His canine companions, who seem to relate to dogs he owned in the late 1860s and early 1870s, especially the very characterful American bulldog, appear as his only real companions, while two curious potential customers gaze at his drawings. The artist glances back, hopefully, but also apprehensively. While Gill was never an outsider and was firmly located in the country and society that he depicted, he failed to find for himself a comfortable niche in the emerging structures of the colonial art world. He was Australia’s colonial conscience and a hugely significant artist who presented us to ourselves as we were at a time when society wanted to practise selective amnesia. Title page of The Australian Sketchbook by S.T.G., 1864-65. Courtesy National Library of Australia collection. Emeritus Professor Sasha Grishin AM, FAHA, Australian National University, curated Australian Sketchbook: Colonial life and the art of ST Gill. This free exhibition is now showing at the National Library of Australia, until 16 October 2016.